Then you can tryout to be selected as a guest judge on American Idol! 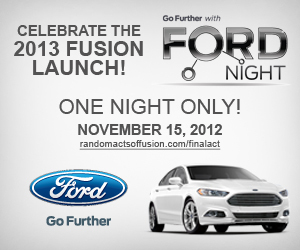 In conjunction with showing off the all new Ford Fusion, we will be raising money for Toys for Tots! For Everyone that comes to the dealership and registers Thoroughbred Ford will make a donation to Toys for Tots! We also hope that everyone will bring a toy to the event. Food will be catered by Cafe Italia from Parkville, MO.